Robinson, Amanda. "Métis Scrip in Canada". The Canadian Encyclopedia, 06 November 2018, Historica Canada. https://www.thecanadianencyclopedia.ca/en/article/metis-scrip-in-canada. Accessed 22 April 2019. In 1870, the Manitoba Act transferred lands from the Hudson’s Bay Company to the Dominion of Canada, created the province of Manitoba and promised land to Métis	families settled in these areas. Two years later, the Dominion Lands Act enabled the granting of lands in the West to various parties, including the Métis. The scrip system was the process by which the Métis could acquire those lands. While the government stated that scrip was to be “dealt with without…delay,” the process was remarkably slow. Government officials did not agree on how to proceed with the distribution of scrip until 1876. Even then, the distribution was not immediate. After receiving petitions in the early 1880s requesting that scrip be honoured, the government passed an order-in-council in 1885 to begin a series of Métis Scrip Commissions to formalize scrip distribution. In place until 1924, Métis Scrip Commissioners visited communities to collect and substantiate claims and to issue Certificates of Entitlements. While the process varied with each commission, Métis applicants often filled out an application and signed an affidavit (a written statement confirmed by oath) before receiving their scrip document. Scrip was given to Métis heads of household living in Manitoba and parts of the former North-West Territories	(including what is now Alberta and Saskatchewan). For the most part, Métis people living outside these areas were not awarded scrip because it was a system concerned with the settlement of the West. The government issued money scrip and land scrip as promissory notes that could be used toward purchasing a future homestead. The land available to the Métis, and the price of that land, depended on the government. 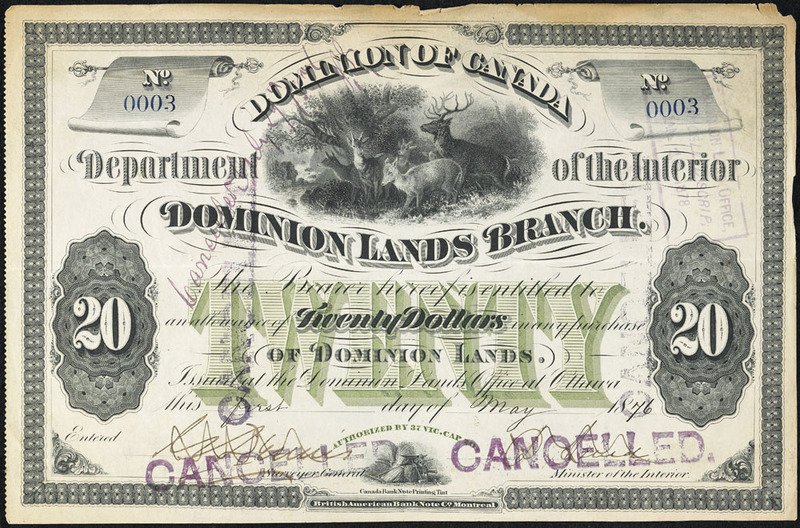 Under the Dominion Lands Act of 1872, land was priced at $1 per acre (equivalent to less than one hectare). With increased western settlement in the 20th century (and therefore, less land available to develop), the value of Western lands increased. However, the Métis were not permitted to select specific lots of land at the time scrip was issued because the land first had to be surveyed, a process that often took years to complete. Redeeming land scrip was a complicated matter that involved a lengthy legal process and government restrictions. Land scrip was non-transferable, meaning that only the person whose name appeared on the scrip could use it to acquire land. The process for doing so was not easy; it involved an understanding of the financial and legal systems of central Canada, which were often unfamiliar to western Métis. Redeeming land scrip also sometimes involved the Métis travelling great distances at their own expense in order to get to a lands office. The federal government placed restrictions on which lands Métis people could homestead, primarily offering only lands in the southern and western parts of Manitoba. Some families living in the north were therefore forced to relocate hundreds of kilometres from their homes and communities. Others were compelled to sell their scrip, ultimately loosing value on their allotments. Money scrip was transferable and was therefore more popular (until about 1900, when the value of land in the West increased) because it could be redeemed fairly easily. However, there were disadvantages to money scrip. Some Métis people sold their money scrip to land speculators for much less than it was worth, either because they needed funds or were cheated out of the true value. In other cases, individuals retained their money scrip for decades, and then experienced devaluation when land prices rose but the value of their scrip remained the same. Another problem involved fraud: since the name of the person who owned the money scrip was not on the document, it was possible for fraudsters to redeem the scrip. Despite rules about how scrip could be redeemed, an underground market for scrip grew as land speculators sought access to these documents. There were reports that scrip was used as currency	to pay not just for land, but to settle debts and to pay for goods and services. While government policy discouraged these practices, there is debate over the extent to which the state	enabled the fraudulent use of scrip through lax administration and regulation. It was difficult to verify the identity and entitlements of Métis money scrip holders because their names were not printed on the documents. In addition, there were documented cases of individuals having their scrip mishandled and their claims to land ignored by government officials. From 1885 to 1924, scrip commissions served to extinguish Métis title to land in the West so that the government could use the land for commercial development and white settlement. (See alsoAboriginal Title.) Scrip commissions included: the Manitoba Commission, the North-West Half-Breed Commissions, the Alberta/Assiniboia and Saskatchewan/Manitoba Commissions, and the Manitoba and North-West Territories Commission. Scrip commissions were also set up during the negotiations of Treaty 8 (signed in 1899), Treaty 10 (1906) and Treaty 11 (1921), as well as during the adhesions (additional signings) to Treaty 5 (1908) and Treaty 8 (1901). Unlike First Nations peoples, who negotiated the Numbered Treaties with the government as bands (groups of people), the government dealt with the Métis on an individual basis. Some Métis people argue that this served to divide their communities. Others contend that individual Métis could not have surrendered title to lands that were held by the community as a whole. The scrip system, and accompanying treaty system, has consequently contributed to conflicting perspectives between Métis people and the federal government over rights	to traditional lands. Métis people have since been involved in modern treaties (those signed after 1973), such as the Gwich’in Comprehensive Land Claim Agreement (1992) and the Sahtu Dene and Métis Comprehensive Land Agreement (1993). In these cases, the Métis agreed to surrender their claims to scrip in exchange for treaty rights. The Métis Nation was directly involved in the negotiations of these modern treaties, a departure from their previous exclusion as a collective in the historic treaty system. In 1993, two Métis men, Bruce Morin and Dennis Daigneault, were charged with fishing offenses in Saskatchewan. As part of their defense, they argued that they had Indigenous rights to fishing. The Saskatchewan Court of Queen’s Bench found that section 35 of the Constitution	gave Morin and Daigneault the right to harvest fish for food. Moreover, the court ruled that scrip issued in accordance with the Dominion Lands Act of 1872 did not take away Métis ancestral rights because they made no specifications about rights to hunting and fishing. To date, this court decision and that of R. v. Powley	(2003) are the only ones that recognize Métis harvesting rights in accordance with section 35 of the Constitution. In 1981, the Manitoba Métis Federation (MMF) took the federal government to court, arguing that the Métis	did not receive the lands they were promised in the Manitoba Act of 1870. One point of contention was that the scrip system failed to provide the Métis with the homesteads they were guaranteed. After 32 years of litigation, the MMF took their case all the way to the Supreme Court of Canada. In 2013, the court ruled that the federal government did, in fact, fail to distribute lands to Métis peoples in accordance with “the honour of the Crown.” The long delay (10–15 years) in distributing scrip and allotting land to Métis people after 1870 increased sales to non-Métis people, which was inconsistent with the intent of the Manitoba Act. In 2016, the MMF and federal government signed a Framework Agreement for “advancing reconciliation” and to address issues brought forward during the MMF case.